Take a look around the Internet and you will find thousands of online slots to play. The most popular are slot machines offering progressive or random jackpots. Take it a step further and you will find a 20 to 25 pay line penny slot with a random jackpot is even more popular. Then again, nothing can compete with slots offering some of the best bonuses and random jackpots at the same time. Even though this game can be extremely hot or cold, it’s very popular. A bonus is awarded when three or more idol symbols land on any of the reels after a spin. If four idol symbols surface, you win 15 spins, and 5 idols will provide 25 free games. Throughout the bonus, each additional idol you see on any given spin, will add another free game. We’ve seen over fifty spins before the bonus ended. n addition, all wins are tripled. If you can catch this game at the right time, it can provide huge payouts. 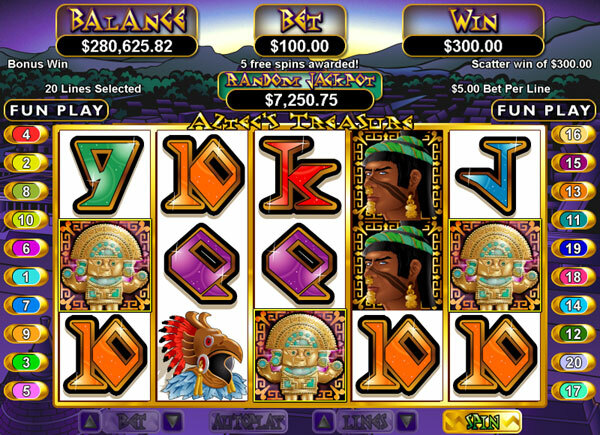 In addition, most online casinos also offer random jackpots with Aztec’s Treasure. This 5-reel, 30 line, 3D-slot machine has an intro video that entices everyone to play; at least once. In addition, there are several bonuses throughout the game, so it is possible to hit all of them in a shorter amount of spins. Slot Machine Feature – In order to hit the slot machine bonus you must have at least three slot machines present after any given spin. 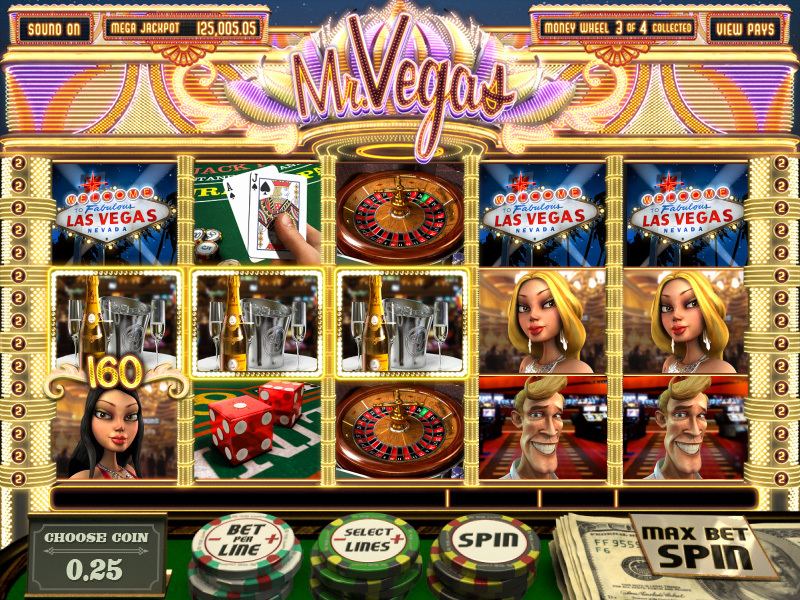 Each machine represents one spin, and when the bonus is rewarded, an old-fashioned 777 slot is revealed (even though it is called Mr. Vegas in the game). Keep in mind; it’s possible to win a large sum of money or nothing at all. However, this bonus does tend to come up more often, so you should have plenty of chances to win. Free Spin Bonus – Hitting this bonus requires a dice symbol on the left or right side, as well as Mr. Vegas on one of the first 3 pay lines. The amount of spins received will depend on the number rolled on the dice. For instance, if you have a total of 10 on the dice, then you receive 10 free spins. The winnings can also be doubled each spin if you initially have doubles (e.g. 4 and 4 on the dice) when the bonus is activated. Money Wheel Feature – Even though this is a difficult bonus, it can provide access to the progressive jackpot. There are arrows found on some of the reels, and if one arrow comes up on each reel, you win the bonus. Once you enter the Money Wheel Feature, you can win any of the other bonuses offered, as well as the jackpot. Roulette Bonus Round – If Mr. Vegas lands on reels 1, 3, and 5, the roulette bonus round will be initiated. Anytime this is rewarded you automatically win something. The number you choose on the roulette board always hits and your winnings will be based on the line bet you played. This virtual slot machine doesn’t provide a 3D appeal, but it does offer some huge payouts. Most online casinos offer a random bonus with this game, so any spin can result in winning the jackpot. In the meantime, focus on the Caesar symbols, because they have a plethora of benefits. Free Games – In order to reach the free game bonus round, there must be at least one Caesar on reels 1, 2, 3, or 4, and a coliseum on reel 5. During the free games bonus, all prizes will be doubled. 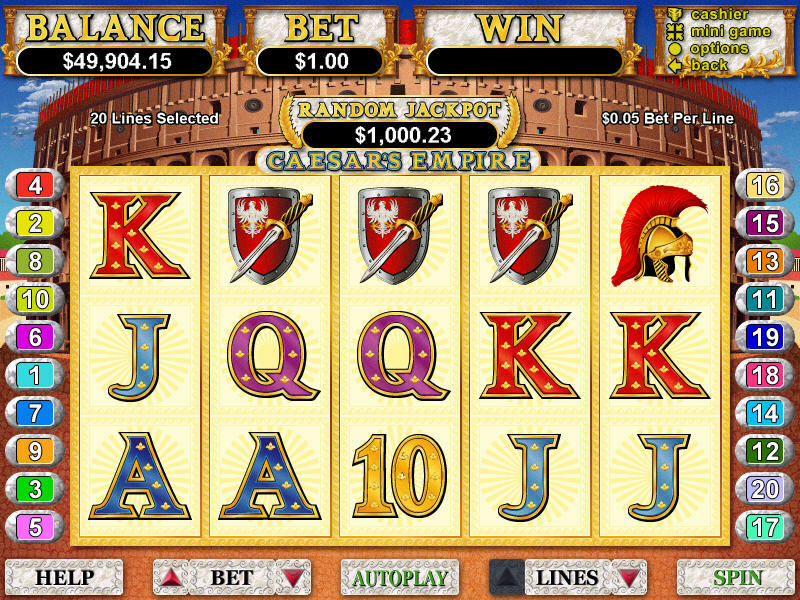 If any Caesar symbol presents itself during the bonus, each one will provide additional free games (anywhere from 1 to 5 extra spins per symbol). This is a huge benefit, and part of the reason this game is so popular. There is also the possibility of a Caesar symbol landing on reel 5. This can only happen in the bonus round, and if it does, then all coliseums are changed to Caesars or Cleopatras. Normal Game Play – Anytime a Caesar symbol is connected with a winning combination, it will triple your winnings. Each one of these online casino slots are considered to be popular choices. While they vary in bonuses and appeal, each one of them offer a chance to win a large sum of money.